These days wedding cakes no longer are just plain white with a few flowers, they have become beautiful accessories to your wedding day. 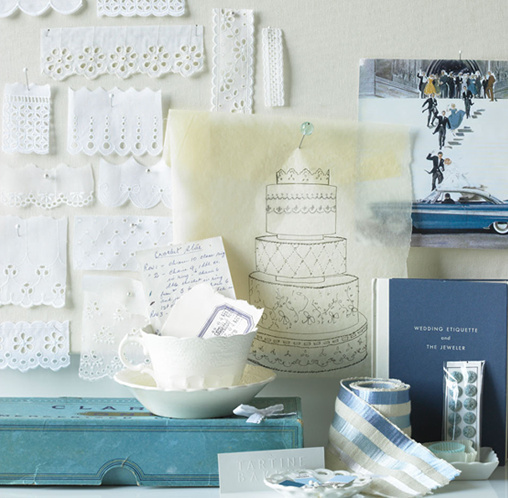 In Martha Stewart's Wedding Cake Book, Wendy Kromer shares with us the method behind creating her one of masterpieces. 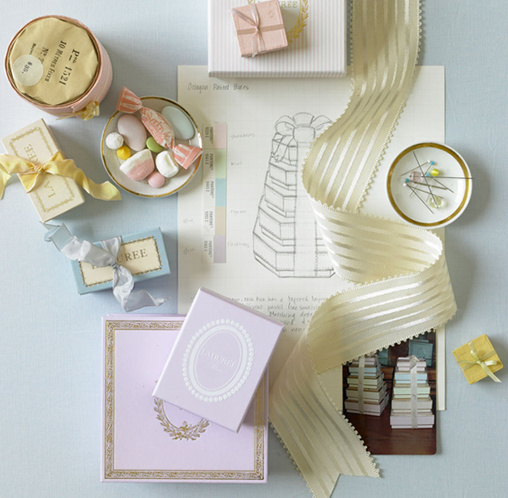 "With each bride and groom, my goal is to learn what is important to them for their wedding. I love to hear how they met, how and where thy got engaged. Everyone has a story, and that story is revealed when I get to know the couple. The wedding venues caterer, and florist, combined with the couple's personalities and color palette or theme, help me understand their vision for their wedding day. 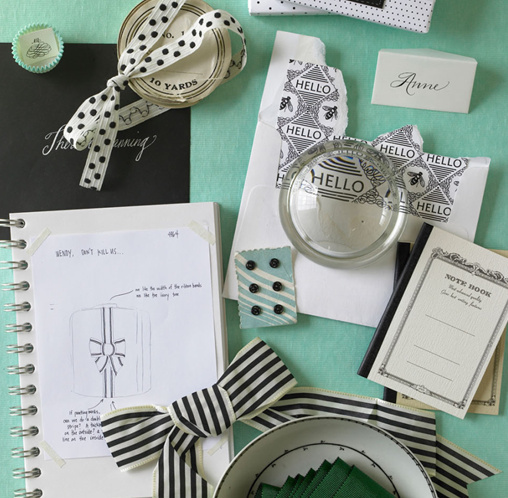 Then I am able to start sketching ideas for their cake." This is such an excellent book, not only for aspiring bakers but for brides to be to find wedding cake inspiration. 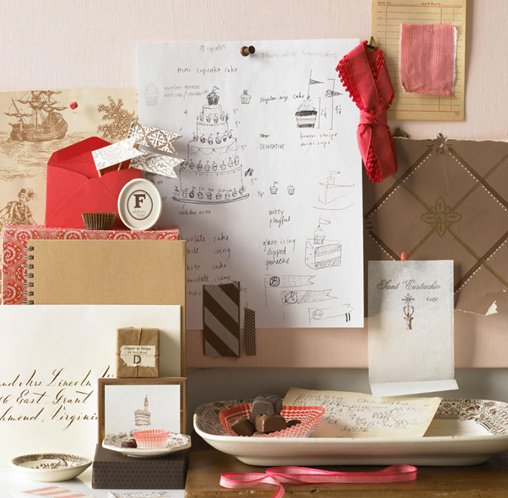 Take a few pointers from Wendy and make an inspiration board for your wedding cake baker on your dream cake. "The sweet, shimmering details of nineteenth-century lusterware china inspired the borders on this cake. The motifs adorning each tier replicate patters on actual china pieces. They where painted by (steady) hand onto the fondant covered tiers using powdered food-coloring mixed with pure lemon extract. 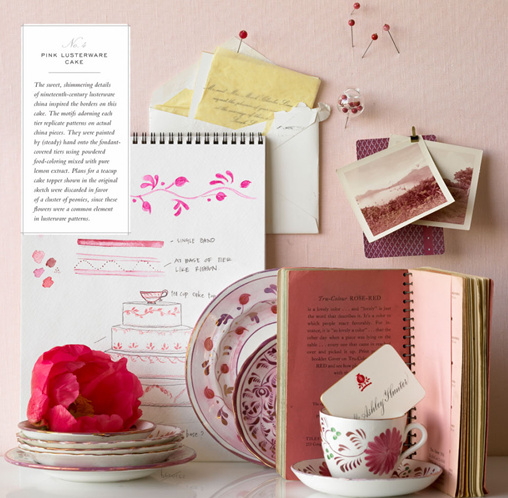 Plans for a teacup cake topper shown in the original sketch were discarded in favor of a cluster of peonies, since these flowers were a common element in a lustware patterns." Ahh What Flavor To Choose? 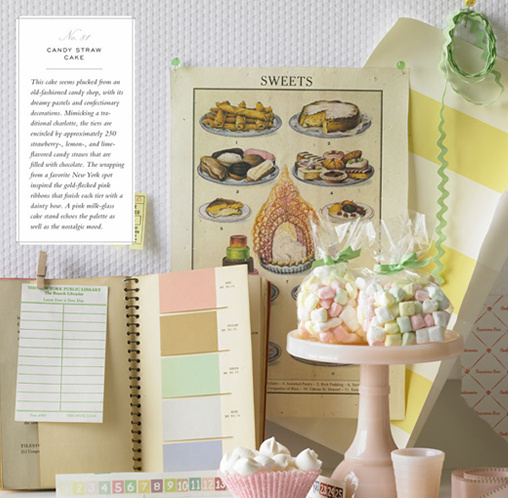 Another great aspect to this book is the flavor combinations. So many many choices. When you visit a baker, you may be offered a selection of small portions similar to these. Try bites of the different cakes, frostings, and fillings together, so you'll know how they'll work in the finished creation. 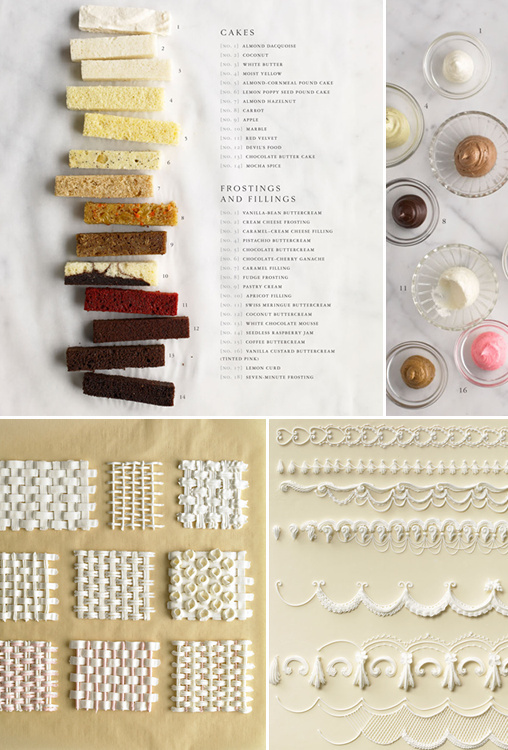 All these amazing photos where taken by Johhny Miller Photography and you can learn more about Wedding Cakes in Martha Stewart's lovely Wedding Cake Book.